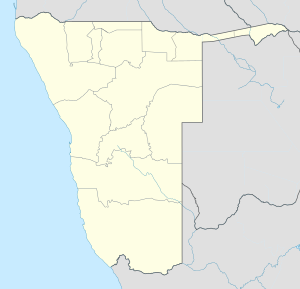 Karibib is a town in the Erongo Region of western Namibia. It has 3,800 inhabitants and owns 97 square kilometres (37 sq mi) of town land. Karibib is the district capital of the Karibib electoral constituency. It is situated on the Khan River, halfway between Windhoek and Swakopmund on the B2 (Trans-Kalahari Highway), the main road between the Walvis Bay and Johannesburg. The town is known for its aragonite marble quarries and the Navachab Gold Mine. Karibib was a waterhole known to the Herero under the name Otjandjomboimwe. Expecting business opportunities arising from the railway construction work between Swakopmund and Windhoek, Eduard Hälbich, merchant at Otjimbingwe, bought the waterhole and 20,000 hectares of land surrounding it from Herero headman Zacharias Zeraua. The deal was finalised on 7 January 1895, the purchase price was 22,500 marks (ℳ), two ox wagons, and 742 pounds 5 shillings that Zeraua had incurred in debts in Hälbich's shop in Otjimbingwe. Hälbich then opened a branch at Karibib in 1897 or 1898. In 1900, the settlement had a population of 10 (and an unknown number of Blacks that were not counted). Karibib began to grow quickly when on 30 May 1900 the railway construction reached the newly founded place. 1 June 1900 marks the day of the official foundation of Karibib at the occasion of the first train arriving from Swakopmund. The railway station was built, a medical practice, storage facilities, a prison, and living quarters were erected, and the population rose to 274. This development disadvantaged the settlement of Otjimbingwe; ox wagons that before would travel via Otjimbingwe on the Alter Baiweg (Old bay path) would now take the route through Karibib. When the railway workers moved on towards Windhoek in 1902, business quieted down. In 1904 the place became again important as a railway hub for ferrying troops in the Herero and Namaqua War. Its status was upgraded to that of a county, and governance was extended to include Omaruru. At the end of the war in 1907, Karibib counted 316 white residents, and the remaining Herero land was expropriated and offered to white farmers. Karibib was declared a municipality in 1909, and Eduard Hälbich was its mayor. One of Karibib's oldest buildings is the Roesemannhaus (Roesemann's house), erected 1900 shortly after the town was founded. Other historic structures are the Wollhaus (Wool house), erected in 1900 from local marble, the Railway station building (1901), the Kaiserbrunnen (Emperor fountain, 1906-1908), and the Christ Church (1910). The Navachab Gold Mine owned by QKR Namibia is located 10 km from Karibib town. The mine is the major employer of the town. In 2008, proposals surfaced for a new cement works. Karibib is connected to the TransNamib railway network; Karibib Railway Station is situated downtown. The next station to the west is Kranzberg, the junction for the branch railways to Tsumeb and Grootfontein from the line to the capital Windhoek. North of the town is the location of the headquarters of the Namibian Air Force at the Karibib Air Base, housing the Command of the Air Force. The air base has an 2,600 metres (8,500 ft) asphalt runway, parallel paved taxiways and apron. The history of Karibib Airport goes back to pre-independence when it was used by the South African Air Force. Karibib was downgraded from municipal to town status in 2010. It is now[update] governed by a town council that has seven seats. In the 2010 local authority election in Karibib, a total of 990 votes were cast. SWAPO won with approximately 60% of the vote. Of the three other parties seeking votes in the election, United Democratic Front (UDF) received approximately 31% of the vote, followed by RDP (9%) and the Congress of Democrats, which, despite being on the ballot, did not receive a vote. SWAPO also won the 2015 local authority elections, gaining 4 seats (653 votes). 2 seats went to the UDF (223 votes), and the remaining seat was won by the local Karibib Residents Association that gained 128 votes. Schooling in Karibib started as a private missionary enterprise in 1902. From 1907 the Deutsche Schule Karibib (German: German School Karibib, also: Privatschule Karibib) operated in town, first as a government school of Imperial Germany, and after World War I as private school supported by German government. In 1965 it had 13 teachers and 53 learners. When competition from other German schools eroded its pupil base, the school closed down in 1986. The campus is currently leased to the similarly named but unrelated Karibib Private School. Karibib is also home to Karibib Junior Secondary School and Ebenhaeser Primary School, situated in the Usab Location. Karibib Junior Secondary School emerged from Ebenhaeser Primary School when the latter was started offering classes beyond grade 7. The Navachab gold mine in Karibib has played a major role in developing the school. Karibib Junior Secondary School is situated in town and offers grade 8 to Grade 10. Karibib is home to Usab Stadium. There is a golf course at the Klippenberg Country Club. ^ "Four towns re-elect mayors". The Namibian. NAMPA. 9 December 2013. ^ "ELECTIONS 2010: Erongo regional profile". New Era. 16 November 2010. Archived from the original on 6 September 2012. ^ a b c Henckert, Wolfgang (16 March 2006). "Karibib". Henckert Tourist Centre. Archived from the original on 11 July 2011. ^ Dierks, Klaus. "Chronology of Namibian History, 1900". Retrieved 17 November 2010. ^ von Schmettau, Konny (28 February 2013). "Karibib-Eine Bahnlinie verändert das Land" [Karibib-A Railway Line Changes the Country]. Allgemeine Zeitung (in German). Tourismus Namibia monthly supplement. p. 9. ^ "Cement factory to be opened at Karibib". The Namibian. NAMPA. 16 July 2008. ^ Hartman, Adam (24 November 2009). "NDF airforce base shrouded in secrecy". The Namibian. ^ Hartman, Adam (27 August 2010). "Town regrading a 'sad move'". The Namibian. Archived from the original on 17 March 2012. ^ "Local elections results". Electoral Commission of Namibia. 28 November 2015. p. 1. Archived from the original on 10 December 2015. ^ "Deutscher Bundestag 4. Wahlperiode Drucksache IV/3672" (Archive). Bundestag (West Germany). 23 June 1965. Retrieved on 12 March 2016. p. 31. ^ "Privatschule Karibib: Die Schule, die eine Stadt begründete" [Karibib Privatschule: the school that formed a town] (in German). Henckert Online (via Projekt Lilie). Retrieved 19 March 2012. ^ Irene, !Hoaes (24 June 2008). "Karibib Cluster Marks Children's Day". New Era. Archived from the original on 21 February 2013.